Airdate was September 22, 1973. 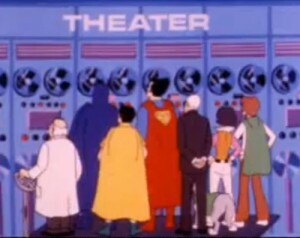 The Super Friends consist of Superman, Wonder Woman, Aquaman, Batman, and Robin. Wendy, Marvin, and Wonder Dog are the “Junior Super Friends.” They haven’t made partner yet. They also have no super powers other than Wonder Dog’s ability to almost speak. Short Synopsis: Machines start operating on their own. It turns out a dude named Professor Goodfellow has invented the world’s biggest computer, whose purpose is to “free mankind of all physical labor, brainwork, and responsibility.” It’s called “G.E.E.C” – Goodfellow’s Effort Eliminating Computer. Mr. Huggins, some random guy representing the government turns down PG’s “gift” to America – so PG offers G.E.E.C.’s services to the world for free. Everyone becomes fat and lazy (this episode would work perfectly as a prequel to WALL-E). 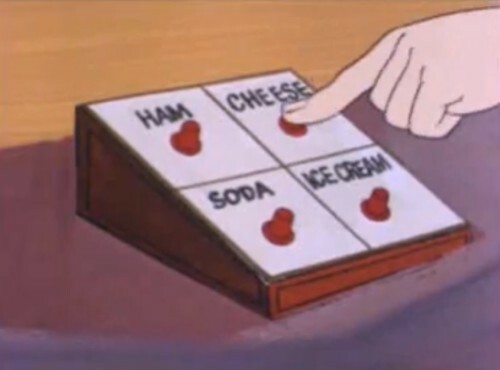 The whole thing falls apart because Goodfellow leaves a freakin’ sandwich in the mainframe and a mouse gets in there and ruins everything. For reals. 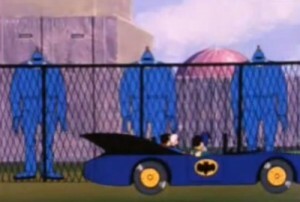 “We can guess why you’re here Mr. Huggins – weird things are happening.” – Batman, ever astute. Is This Something to be Shocked About? I Dunno, Flip a Coin. Superman is Keenly Aware of How Busy He is. Oh, no, Superman, don't get up. 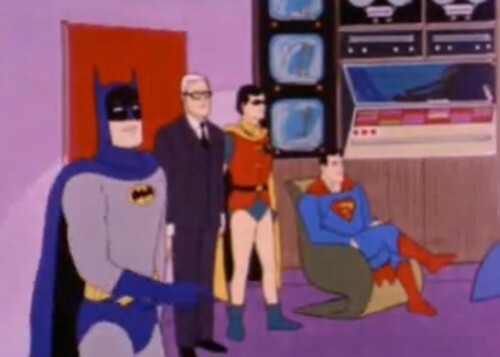 This is Wendy, Marvin, Batman, Mr. Huggins, Robin, Wonder Dog, Professor Goodfellow, and Superman on what looks like a pontoon boat on wheels, touring the giant computer. Professor Goodfellow explains that even actors and athletes won’t have to work, as they’ll be replaced with robots. This is the part of the computer that covers all of the world’s “theater” needs. Attend the tale of Sweeny Bot. Allegedly, all the Super Friends have communication rings so that they can constantly ask each other for help when they screw up. 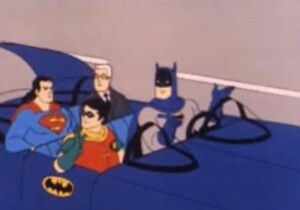 However, earlier in the episode Robin had to use a CB radio to contact Superman and the only two they actually SHOW with the rings (on their left hand ring fingers) are Batman and Superman. Oh, no, I can’t be in The Justice League, but when someone needs to get a mouse out of the largest computer in the world, all of a sudden Plastic Man is everyone’s best friend. 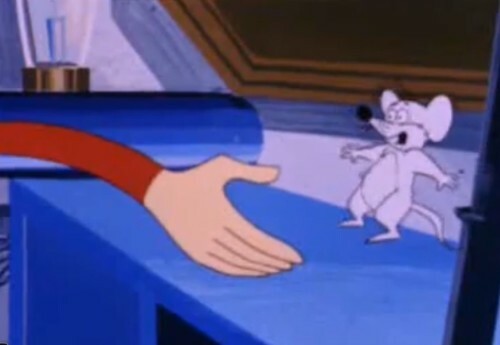 Yes, that’s right – Plastic Man makes a cameo and saves the day because only he could get through the “tube” that leads to the mouse. I will say this about the episode: what would normally be a highly mock-able plot point for anyone else – complete concern for the safety and welfare of the mouse in the face of the entire world falling apart – gets nothing but kudos from me. 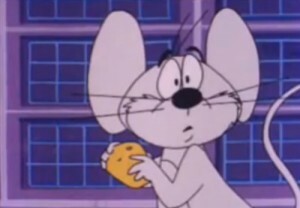 All he wanted was a sandwich and some cheese, and isn’t that what we all want in this life? So, Plastic Man saves the day, and Wendy decides to keep the mouse as a pet. Everybody wins. Except for all the people involved in plane crashes and other G.E.E.C.-related mishaps, of course. But if they aren’t going to dwell on it, neither will I. If you would like to witness these shenanigans in all their glory, the first season of Super Friends is available on DVD. This is an affiliate link.